The Lulumum blog now has a mobile version for your convenient on the fly lulu updates. There is no need to enter a special URL, just bookmark the lulumum blog (http://lulumum.blogspot.com/) on your phone and your phone will automatically load the mobile site for you. The only hangup with the new mobile version is that it doesn’t allow you to leave comments and is read only. The links should still work fine as well as all the other functions of the blog so it’s not a huge inconvenience but you’ll have to leave me your comments from your computer as your comments are always appreciated. 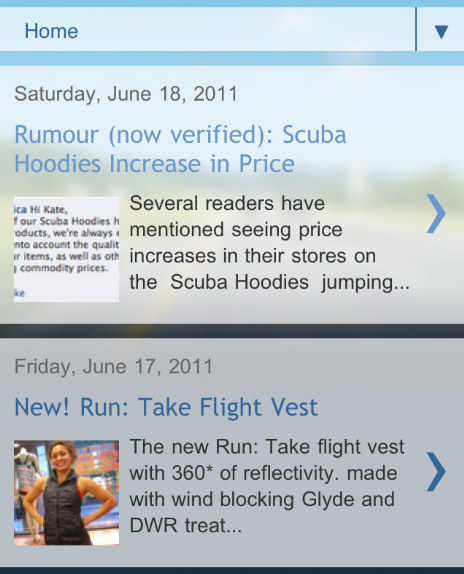 "Rumour (now verified): Scuba Hoodies Increase in Price"
Looks wonderful….written from my iPhone!